I needed to debug a windows service using Visual Studio, and was able to use the Attach to Process… feature in the IDE. Even though Visual Studio was attached to the executable, it still didn’t stop at any breakpoints. I thought I could fix this by using Build->Configuration Manager to change the Configuration from Release to Debugmode, but the Configuration Manager option wasn’t available. After searching the internet, I found a forum, with a solution that worked for me. 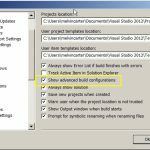 “Show advanced build configurations” was unchecked, once I checked this option the Build->Configuration Manager was available again. This entry was posted in Visual Studio on September 19, 2012 by Mel. JScript is the Microsoft implementation of the ECMA 262 language specification (Source). ECMAScript is the scripting language standardized by Ecma International and is widely used for client-side scripting on the web. This is a question that was asked during an interview and I didn’t know the correct answer, so I thought I would add the information I found to “My Online Notepad“. Maybe it can also help someone else. Hash Tables – A collection of key/value pairs that are organized based on the hash code of the key. The Dictionary(Of TKey, TValue) and ConcurrentDictionary(Of TKey, TValue) classes have similar functionality as the Hashtable. The elements of Hashtable are of type Object, so boxing and unboxing typically occur when you store or retrieve a value type. Dictionaries – A collection of keys and values. Typically provides better performance than a Hashtable for value types. Lists – A strongly typed list of objects that can be accessed by index. Provides methods to search, sort, and manipulate lists. This entry was posted in ASP.NET, C#, VB.NET, Visual Studio on August 2, 2012 by Mel. I ran across this bug today but my workaround was surrounding an Image control with anchor tags. This entry was posted in ASP.NET on January 13, 2012 by Mel. XML documentation parse error: Whitespace is not allowed at this location. XML comment will be ignored.
''' This is a comment with an ampersand & causes a warning in Visual Studio. 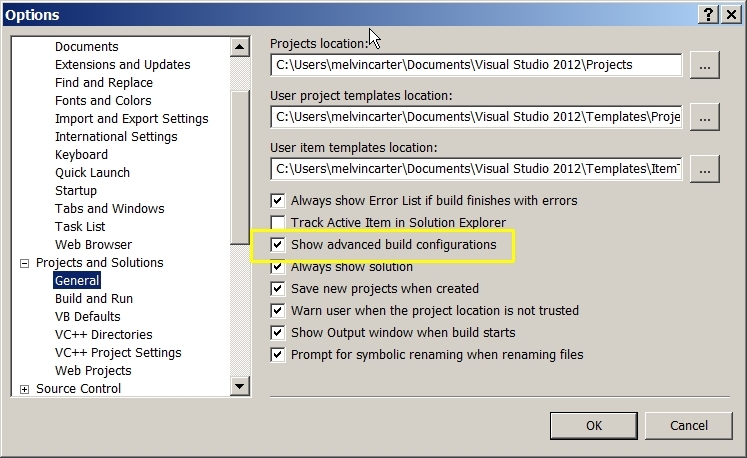 This entry was posted in C#, VB.NET, Visual Studio, XML on January 11, 2012 by Mel. The Boolean object represents two values either “true” or “false”. If value parameter is omitted, 0, -0, null, false, NaN, undefined, or the empty string (“”), the object has an initial value of false due to automatic type coercion. This entry was posted in ASP.NET on November 4, 2011 by Mel. Here’s a way to check to see if a function exist before calling it.